Finding a tax preparer just got easier! Now you can find a tax preparer in your area by services offered, industries and language criteria. Please use the search on the homepage of our website to find a tax preparer in your area that specializes in the services, industry or language you seek. We recommend that you contact a few local tax professionals before choosing one. Below please find some additional important information to help you find a tax preparer who is right for you. All professional tax preparers must register with the IRS and obtain what is referred to as a PTIN. 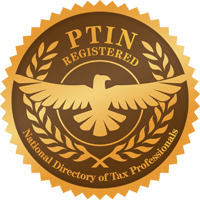 The PTIN is an acronym that stands for Preparer Tax Identification Number. Don’t put yourself at risk of identity theft or IRS scrutiny. Make sure your tax preparer is registered and has a PTIN. Registered tax preparers can have different professional credentials. Not all qualified tax preparers are accountants or CPAs. Certified Public Accountants are licensed on a state by state basis. While all CPAs must pass a rigorous four-part exam, meet certain experience requirements and maintain a minimum standard of continuing education requirements, not all CPAs are licensed to prepare tax returns. An Enrolled Agent (EA) is another credential sanctioned by the Internal Revenue Service. Enrolled agents are tax preparers that meet standards and continuing education requirements set by the IRS. Attorneys that prepare tax returns and fiduciary returns such as estate returns also register with the IRS. Find a tax preparer that specializes in the industry or service you are requesting. Not all tax preparers understand restaurants. Not all tax preparers understand health professionals. Find a tax preparer that understands your specific industry or profession or even culture. Use PTINdirectory’s search feature to find a tax preparer in your area that provides your requested service, understands your industry or profession or even speaks your language. A great tax preparer is a life-long relationship. Find a tax preparer you feel comfortable with. Find a tax preparer that explains to you what they are doing. A great tax preparer will educate you and not leave you in the dark. Remember, it is YOUR tax return and you are ultimately responsible for what it says. Don’t allow your tax preparer to create or make things up without documentation provided by you to support the income or deductions claimed. Don’t judge a tax preparer merely by the size of your refund. When you receive a refund, you are receiving basically your own money back that was previously withheld. If you have lots of withholding at your job during the year, you may receive a larger refund than someone with the same taxable income that had less withheld during the year.